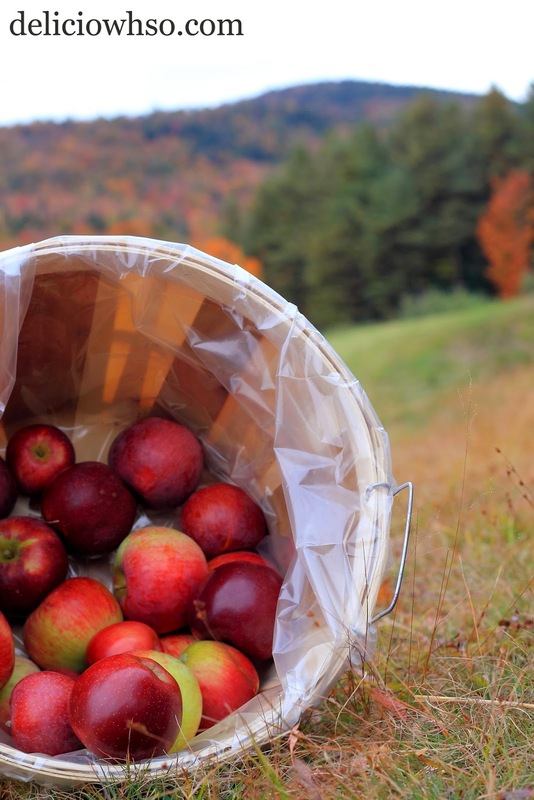 Fall has come and apple picking season is here! I recently went apple picking and it yielded some delicious results! 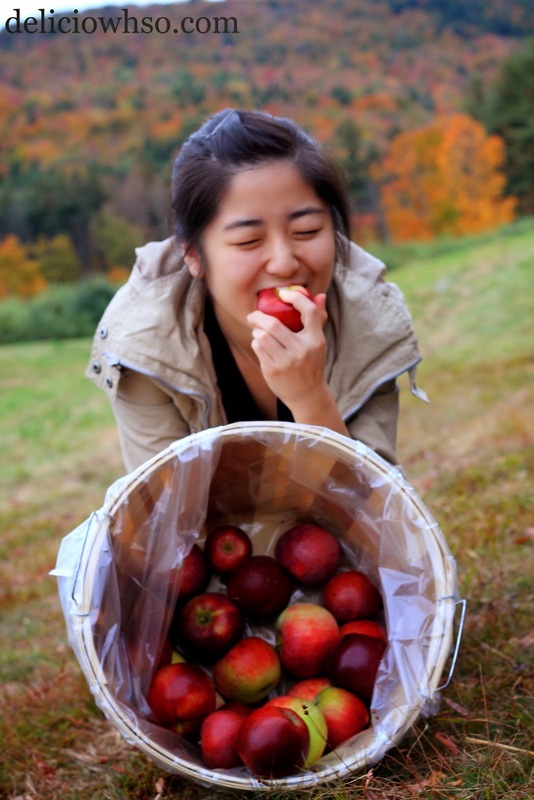 While I was in Hebron, NH, a group of students and I went to a local apple orchard and picked to our heart's content! Lately, I find that many of my friends from all over the country are utilizing the season to go apple picking. 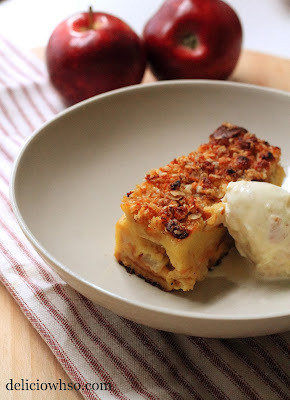 For those of you who have more apples than you can eat, try your hand at some delicious fall desserts. Apple pie is always a favorite when apples are in season. Click here to see my recipe for apple pie :) However, this time I wanted to try something different. I used some traditional fall favors like cinnamon, maple, and apples to create some delicious bread pudding and ice cream! This isn't your traditional bread pudding and ice cream. 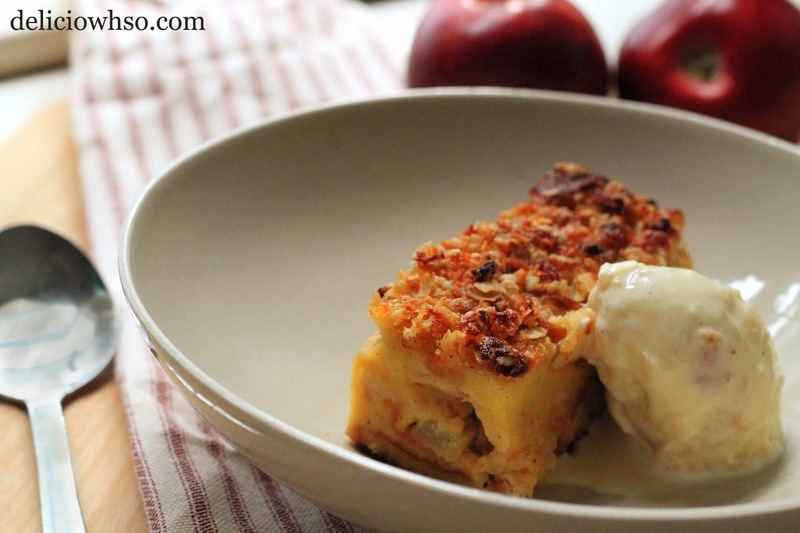 The bread pudding has a oatmeal gruyere topping that perfectly accompanies the sweetness of the apples. It's made with Portuguese sweet buns from a local bakery. The ice cream is a maple, bacon, and roasted apple ice cream that is a perfect balance of sweet and savory. The saltiness of the cheese and bacon balances the sweet brown sugar and maple syrup in the bread pudding and ice cream to create a delicious fall dessert. 1. Peel, core, and medium dice apples. 2. Heat a saute pan and add butter. 3. Once hot, add apples. Season with salt, pepper, and maple syrup. 4. Stir until apples are tender. Remove from heat. 5. In a separate pot, place split vanilla bean, milk, and heavy cream. 6. In a large bowl, mix sugar, brown sugar, eggs, and cinnamon. 7. When the milk boils, pour slowly into the eggs. Whisk constantly. 8. Place apples and bread into the mixture, allow to soak. 9. Place into the greased 9x13in casserole dish. 2. Shred Gruyere. Mix into the oats and sugar. 3. Add butter and mix until incorporated. 4. Generously top the bread pudding. 5. Bake at 350F until set. The bread pudding will souffle (expand slightly), and the topping will be golden. 1. Place the ice cream maker bowl into the freezer. Many ice cream makers have a bowl that needs to be in the freezer overnight to ensure proper freezing. Follow the manufacturer's directions for this step. 2. In a pot, heat milk, cream, and sugar. 3. In a bowl, mix maple, egg, and yolk. 4. Once milk mixture boils, pour slowly into egg mixture while mixing constantly. 5. Pour the mixture back into the pot. Turn the heat to low. 6. Mix constantly while touching the bottom of the pot with a wooden spoon. 7. When the mixture thickens slightly, pour through a fine sieve into a bowl. This will remove any curdled egg pieces. 8. Cut bacon into small pieces. 9. Peel, core and small dice apple. 10. In a saute pan, cook bacon. 11. Once cooked, add apple. Then add sugar, salt, maple, butter, and cinnamon. 12. Cook until apples are tender. 13. Pour apple and bacon into the ice cream base. Cover with plastic wrap covering the surface. 14. Place into the fridge overnight to allow the flavors develop. 15. Pour the ice cream base through a sieve to keep the bacon and apple out of the ice cream base. This will keep the apple and bacon intact while the ice cream begins to spin. 16. Spin the ice cream according to the manufacturer's directions. When halfway frozen, add the bacon and apples. 17. Remove the ice cream and into an airtight container. The texture will be similar to soft serve. Allow to harden in the freezer before eating. When serving this dessert, warm the bread pudding in the oven slightly. Serve with cold ice cream on a brisk fall day! Don't forget to share with your friends! Go out and support your local growers by going apple picking!!! Not only is the produce delicious, but it's organic, tasty, and inexpensive! Take those apples and make something yummy to share.